“Eat and dad will love you”. 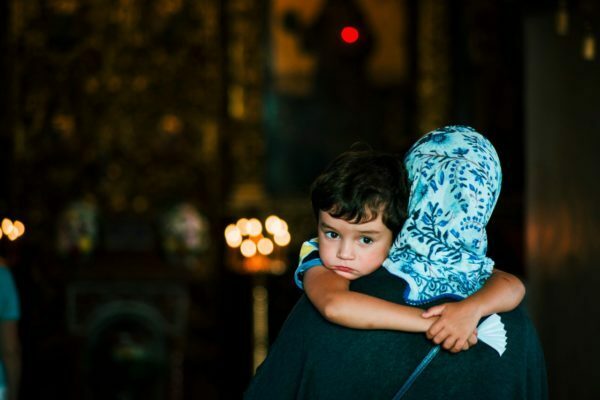 Archimandrite Andrew's reply to the grandmother whose child was choking on food under the threat of being disliked. While talking to children about God, there is no need for smart, complex phrases. This will only confuse a child. One should speak in simple and clear language on such topics. It is essential to be on the same level with children, to understand them. If there is a baby in front of me, I cannot discuss higher matters or theological issues with them. For babies cannot even cross themselves yet. I also cannot demand anything from a child in the same way as from an adult until they have mastered the spiritual alphabet. It is very important that conversations about God inspire children to feel love for Him, moreover to feel personal love. So that they could sense God and not just “because adults said so”. Do you understand that? It is not that children would begin to follow some of our instructions, behave themselves one day and we would look at them and admire them, happy as if we had launched a complex watchwork. It is imperative that children have their own, personal, deep connection with God. That the words heard would settle in their hearts, blend into blood, and become part of their lives. Only such conversations with children about God will bear fruit. After all, the time will come when children will leave you, leave me, leave that greenhouse atmosphere in which they grew up. What will they do then? One cannot raise children in a greenhouse, because sooner or later they will face the reality and find themselves in a place where it is cold, hard and difficult. How do you raise your children? Do you inspire them or just tell them what to do? In case of the latter they will probably behave themselves, be really obedient, pious, and loving until they are fifteen-seventeen years old just because you demand it. However, their relationship with God will most likely be formal. If children do not see what their parents and teachers tell them about at the Sunday school in their lives, then in this case they simply comply with their requirements but do not believe in them thinking to themselves, “When I grow up, I will decide who I should be, and I will do what I want”. Where do such thoughts come from? The reason is that parents and teachers did not show them Christ Who the children could love. The real Christ. They have known only the suppressive, formal “christ”, the fake and superficial one that will never touch a child’s heart. What children see around them is crucial. When I went to Sunday school as a boy we had a teacher who always told us about the good and beautiful. One day when I took the bus home I saw him by the cinema. He was also going home, only on foot, we lived close to each other. Do you know what I did? I sprang from my seat and ran to the back of the bus to look through the rear window at what the teacher would do now. The thing is that we talked with him a lot about movies at that time and he explained to us that there are movies people should not watch. At that moment I was curious to see what he would do. Would he go to the cinema to see some objectionable movie or not? Would he stick to his words? I even decided that if he went inside I would be disappointed in him once and for all. The teacher calmly walked past the cinema taking no notice of the poster whatsoever. I was a very curios boy. Of course, I should not have acted like this in that situation but then I was a child. Primarily a child. How adults treat everything, their actions and not the words are important for children. The creed should not be limited to any time frame. That is why it is not enough to talk to children about God only once a week, at the Sunday school, or during a trip to a monastery, or when we help someone from time to time which is rare. The main thing is what happens in the family, what a child sees in the parental home. Children learn faith from their parents because family is a small Church as the Scripture tells us. If a child sees that parents love each other, that they are one, this will be a true teaching about God, and from Christ himself. Because before meeting God your child meets you. Those of you that have children know that as soon as a woman gives birth, the midwife immediately puts the baby on the woman’s chest. What is it for? It is in order that the baby could hear the beating of their mother’s heart as soon as possible, feel her scent, and get a kiss. Children do not see God yet, they see you. The first “god” for children is you, their parents, then teachers, one by one appearing in their lives. If at the same time we, adults, do not show God to our children in our life, then no matter how eloquently we speak about Him they will not believe us. Family should be an example of Divine unity and love. Otherwise, it is hard to teach faith in God. 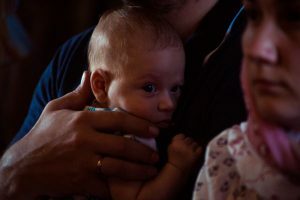 In the Church a child hears fine words but at home passions run high, there are constant quarrels… How could one perceive something in such a situation? 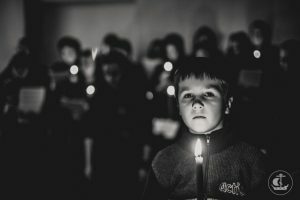 How does one learn the faith in God? I have learned more than anywhere else by teaching at school for twenty years. Children taught me a lot. They always say what they think without pretending to be anyone. As I listened to them I saw that they were looking for God, that they wanted to find the truth; that they wanted to pray, love and be loved and they expected the same from their parents. They expected it but did not get it. What was I supposed to do in that case? Yes, I talked to them a lot, they liked our lessons but those were just lessons. A child attended one lesson, but did not come to another, because, for example, the class went on an excursion. How are things at home, in the family? Once I invited my students’ parents to school. I wanted to show them their children’s final tests, to have a heart-to-heart talk with them. So, I asked them to come without children. Parents came looking elegant, but someone still dragged a child along. One such mother, who came with her son, seeing me immediately made a low bow to me and asked for the blessing. I even thought, “Well, if this woman starts from the blessing, then she is a zealous churchgoer”. After that this mother began to tell me something very pious and I finally was convinced of her spirituality and rejoiced. – Why did you do this? You put me in a very awkward position. – Father, when is the end of this? We are fed up with all this hypocrisy! – It is one way at school and another at home. Look at my mom: how she bowed to you, what words she said. However, at home she and dad constantly argue. He does not hear a kind word from her, nothing of what she has told you! 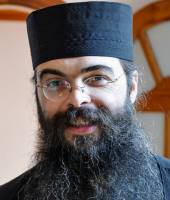 Neither about God, nor about Mount Athos… There are no talks about such things at home. Just scolding. Parents hurt, berate, and humiliate us. One must live in a certain way to teach children faith. Like God did. He did not only state sermons but also ate and drank with his students, slept near them. They constantly saw Him and never ceased to wonder how wonderful He was. He did what He had said He would do. Everyone saw nothing but good from Him all day long. He was not a hypocrite, he did not deceive, pretend, nor tried to make a good impression. It is this creed that settles in a child’s heart. We must help children see God Who loves them without any limits and doubts. At the same time, it is essential to talk about God to younger children individually, to those who are older in another way and to high school students in completely different manner. Helping children to see God Who loves them for no particular reason is necessary, “If you are good and if you go to Sunday school, then God will love you”. We will get the same result that I have witnessed on our street once. A grandmother next door was persuading her grandson to finish eating everything on the plate, “Eat, then dad will love you!” The child was choking on food and I stopped and told his grandmother the following, “No! Both God and dad will love this boy even more if he will not finish eating”. One cannot tell children something that will confuse them in any case. In no case!